QUICK-KILL Pest Control is locally owned and operated. Chris and Melissa Pargeter are both licensed Pest Management Technicians in NSW and Victoria. Chris is a licensed Timber Pest Inspector and holds Certificate III in Pest Management. Having lived in the area all our lives we have extensive knowledge of the local region and conditions. We service residential, commercial, industrial and rural areas. We offer comprehensive, quality Pest Management Services with excellent customer service. 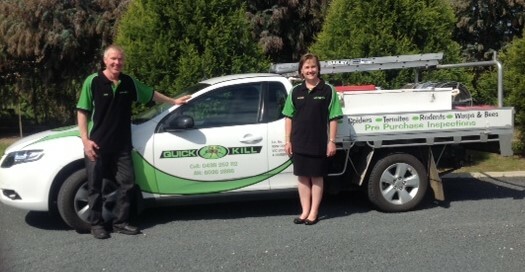 For all your Pest Control needs contact QUICK-KILL Pest Control.